A key component to ACES ll extending engine life is its unparalleled WET START (See pictures below from a study of ACES II paid for by the Department of Energy). 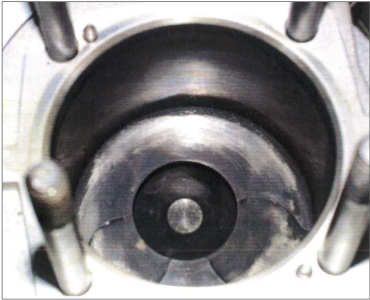 During combustion of fuel treated with ACES II, a thin lubricating film is created and left behind in the cylinder walls. One of the pinnacle benefits of this film is shown at engine start up, called the WET START. Diesel engines without ACES II have a dry start that creates most of the metal-on-metal wear in an engine during its life cycle. Since this harsh wearing process is all but eliminated by the newly formed film, engine life will be extended by using the ACES ll Diesel Fuel Catalyst. The detergency of ACES II systematically removes gum and varnish that has built up over time in the cylinders, fuel pumps and fuel injectors. This build-up is removed a layer at a time (engine friendly). 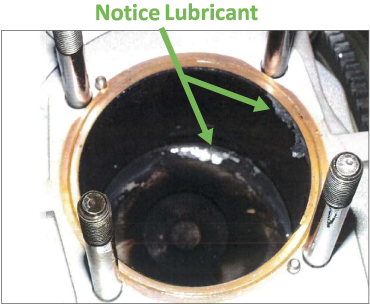 The lubricity of ACES II reduces wear of fuel system components. The results of this detergency and lubricity are improved injector spray patterns, faster ignition, reduced corrosion, and cleaner engine oil. 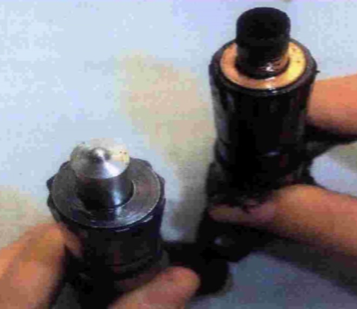 The injector pictured on the left was used with fuel treated with the ACES II product, and the injector on the right was used with untreated fuel.